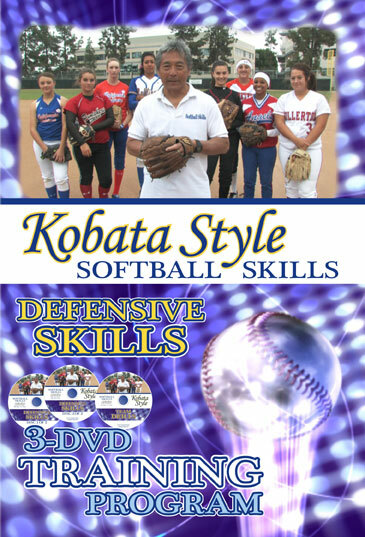 “KobataStyle”™ Defensive Skills 3 – Disc DVD Set: In this 3-disk training set catching, throwing and fielding are all enhanced through application of the “KobataStyle”™. The advanced methods in these three DVD’s show players and coaches how to properly use technique, leverage, position and momentum to improve the speed and accuracy of all their defensive skills. This set also includes ‘KobataStyle”™ Team Drills to improve the efficiency of each practice and teach the best approach for developing both fundamentals and advanced skills. In all, with these fast-pitch drills and softball tips you will learn how to become a superior defensive player at any infield position! I purchased the dvd set at the start of our indoor training. We have seen impressive results quickly, using Howard’s drills and techniques! We are moving the ball quicker and more efficiently focusing on the footwork, quick transitioning to throw and using momentum!! Great drills used to keep practice moving at a fast pace, learning the proper techniques, keeping it fun for the girls while learning from the best in the business!! Thank you Howard!! I noticed you have a new website and it looks great! !